The JCC welcomes Jewish visitors from overseas & locally however we do have some security requirements that need to followed. All Visitors should bring along valid Photo ID (Passport or similar) and comply with our security entrance procedures. All visitors both overseas & local are required to register on arrival at the main reception desk. Tour Groups are welcome but visits must be organised at least one week in advance. If a tour group wishes to visit the Ohel Leah Synagogue arrangements should be made directly with the Ohel Leah Synagogue (contact details below). Visitors are welcome to visit our restaurants and the Koshermart whilst at the JCC. Payment at both locations can be settled by credit card or cash. Overseas visitors are also welcome to use the JCC pool on payment of a daily fee payable at the main JCC Reception desk. Visitors are welcome to join the weekly JCC Shabbat Dinner. You may download a booking form below and return by email or fax. You may also call our main reception desk between 9am to 7pm HKT on (852) 2801 5440 to make your booking. Visitor may also join the various congregational shabbat dinners but should make their bookings directly with each congregation (Contact details below). 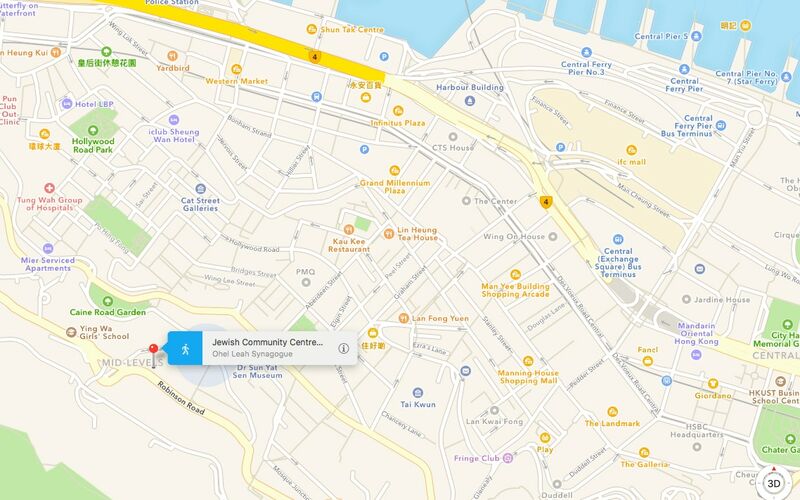 The JCC Hong Kong is situated in the Mid Levels area on Hong Kong Island above the Central business district. It is possible to walk to the JCC by foot or by way of the Mid Levels escalator which will take you up to Robinson Road after 10:30am. The easiest way to reach us is by Taxi which normally takes 10-15 minutes from Central. The fare from Central should be around HK$50 depending on traffic conditions. General Enquiries, Membership Information, Visitors Information, Shabbat Dinner Information.